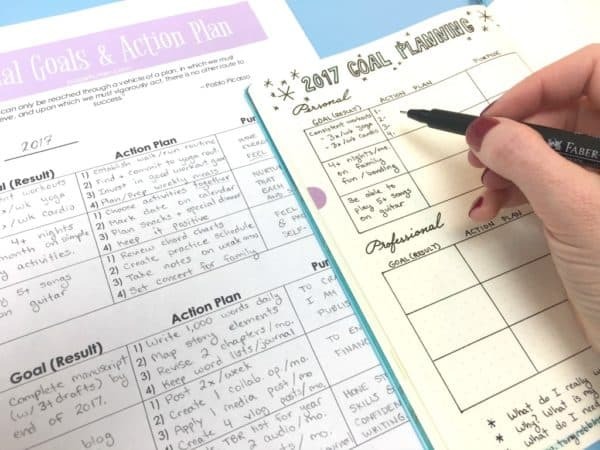 Grab my printable goal setting worksheet and make 2017 the year you finally get things done! Have you ever written out your goals for the year? I don’t mean a New Year’s resolution. 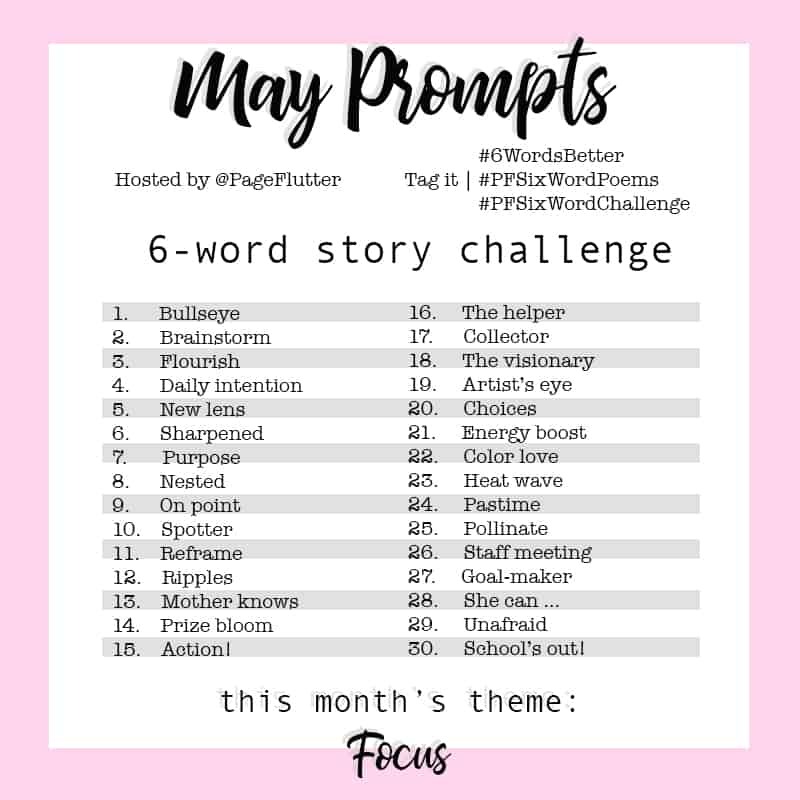 “I’m going to exercise every day.” “I’m going to eat out less.” “I’m going to stop writing my thoughts in italics.” (Oops). I mean an actual plan for accomplishing your big goals. Getting that promotion, publishing a book, growing your website traffic, etc. 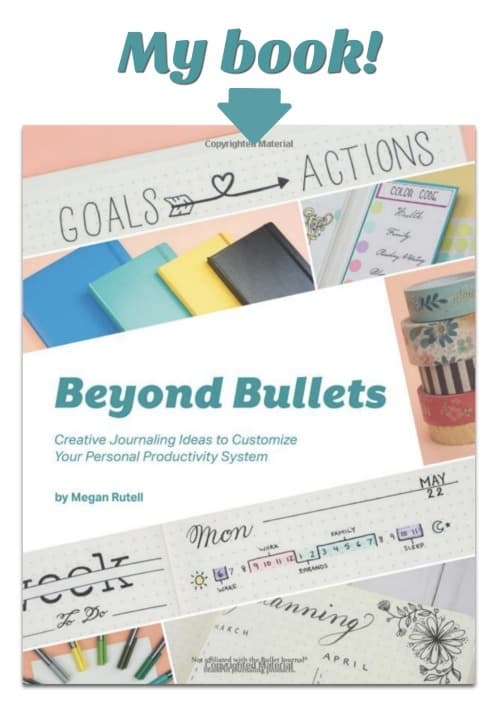 Daily goals are inherent to Bullet Journaling, but annual (or 3-year, or 5-year) goals require more strategic thinking. Life isn’t won in the end zone. It’s a long game–er, in the passing–something about taking it to the hoop…Ok, you caught me! I don’t get sports metaphors. But trust me, goal planning is mega important. It’s tempting to choose goals that your friends and colleagues aspire to achieve. Wouldn’t they all be impressed if I did that? Sure, they might be. But unless the goal is something you really want, you probably won’t have the drive to make it happen. My philosophy is you should start with quiet contemplation about what you want to accomplish. Meditate on it. Pray on it. Think on it. Heck, chew on it for a while. Whatever it takes for you to come face to face with your true goals. Along those lines, I recently started following what Tony Robbins has to say about goal-setting. In particular, his Rapid Planning Method (RPM) resonates with me. 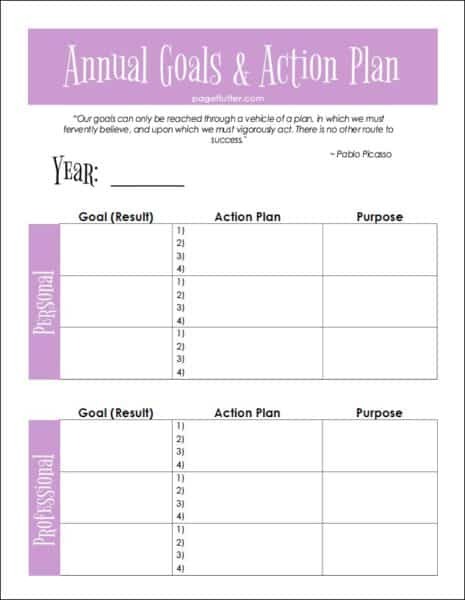 Grab the goal setting printable below and you can follow along with my annual planning process. I started this little tradition a couple years ago, but this year I took the time to formalize it in a printable. I prefer the feel of physical paper. First, I filled out the worksheet in pencil. On a side note, I got a couple J*B Welly from my friends over at J*B Welly, and I have to say they’ve turned me on to pencil again. They feel much smoother than a standard pencil, and the erasers can be moved up for *some people* (not me) who make a lot of mistakes (why are you looking at me?) and have to write everything twice (you’re still looking at me). Yeah, ok, it’s me. My journal is still an ink-only zone, but brainstorming calls for a little flexibility. It’s nice being able to tinker with wording, numbers, and specifics before I commit to ink. I went through a few iterations as before I zeroed in on the goals that mattered most to me. And don’t feel pressured to fill up the worksheet. It’s totally fine (maybe even better) to focus on one or two super-important goals. Blank spaces are cool, my friend! You can fill out the worksheet in whatever order you like, but I started with the Goal (the result I want), then clarified the Purpose of that goal, and created my Action Plan last. I went through this a few times until I was really satisfied with my goals for the year. Next, I copied them into my trusty Bullet Journal so I can keep them handy when I create my monthly & weekly goals. *I’m sure I’ll have at least one person ask, so the journal I’m using is a dotted Leuchtturm1917. 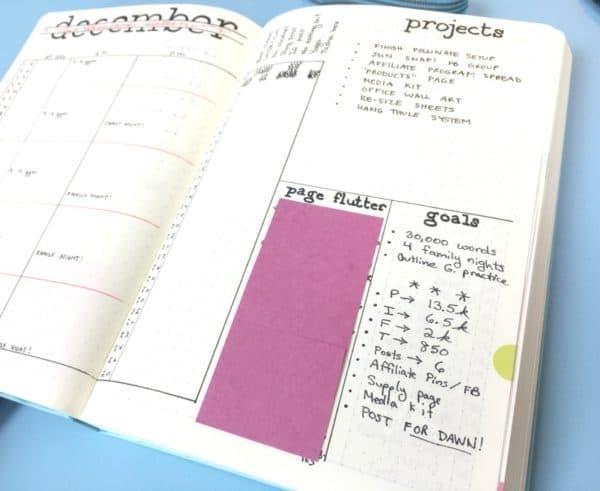 Each month, when I create my monthly spread, I take a few minutes to consider last month’s unaccomplished tasks, as well as my goals for the year. How do my goals this month tie in to my annual goals/long-term goals? I get motivated really easily, but staying motivated is much harder for me (I was a wind-up toy in a past life). I’ve found that giving myself a break when I slip makes my goals seem more attainable. Try not to view your goals in absolutes (i.e. I succeeded/I failed). 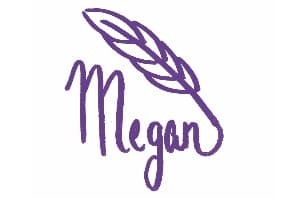 My blog brings in over $1,000 each month for my family. We’re not getting rich, but it sure makes a difference. Not bad for a little side hustle, huh? Find rewards, affirmation, daily reminders that keep you feeling inspired and energized toward your goal. 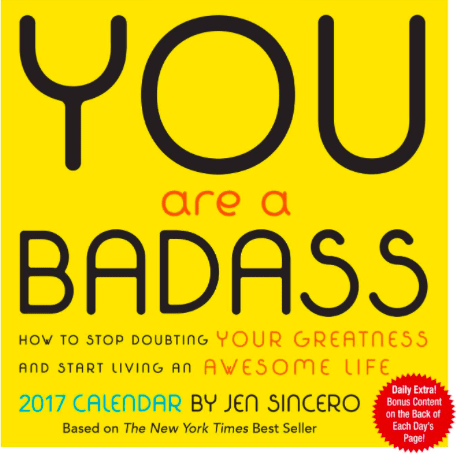 I found this You are a Badass daily calendar to keep on my desk that has quotes, tips, and affirmations. I also keep lists of inspirational quotes in my Bullet Journal, so if I’m having a particularly bad day, I can add a positive boost to my daily pages. 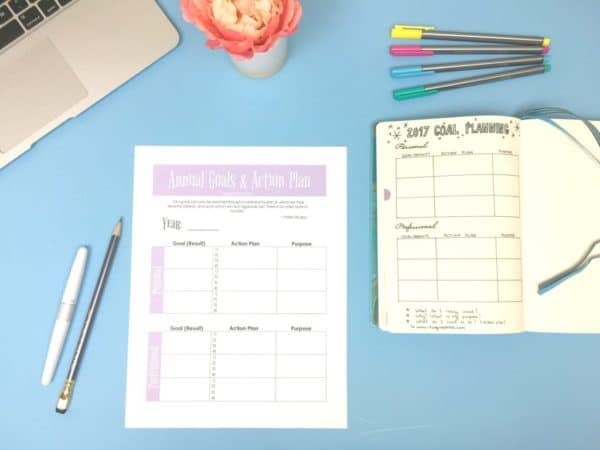 The worksheet will guide you through creating your own personal and profession goals for the year, including specific actions you need to accomplish throughout the year. Download the printable worksheet HERE. *Psst*--> By the way, I sent a special 3-page version of this goal-setting guide to my subscribers. Make sure you sign up for my newsletter to get the extra-special freebies each month. Goal setting is only half the battle. You still have to work for the things you want, and sometimes you won’t reach your goal for reasons outside your control. But having a goal is the first step in achieving it. 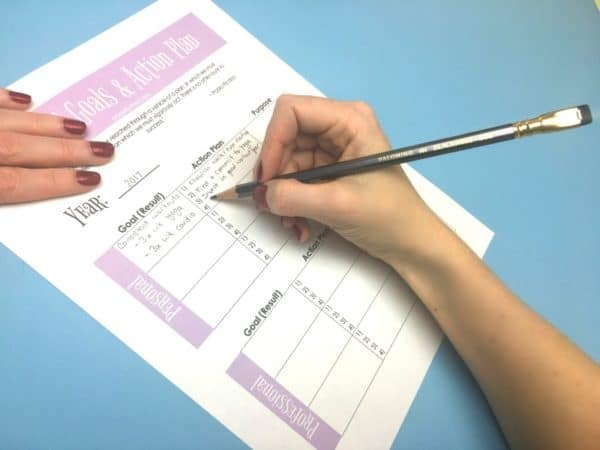 Take 20 minutes to outline your goals, and see where those minutes take you! 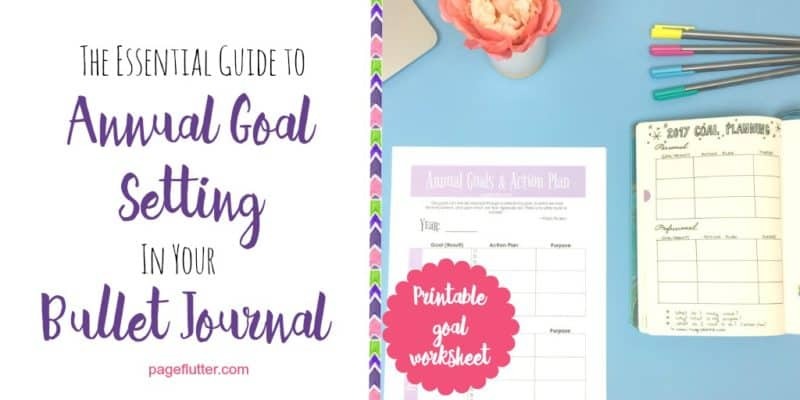 Do you practice goal setting in your journal? What are your favorite ways to stay motivated when working toward a long-term goal? Comment below. Thank you so much! I did send that email request. Love this! Filled out the bottom half the other day. Need to work on the top half!